Everything is functional, thought and built with precise goals. This RIB is fast, safe and soft on the waves, because of a very deep and long "V" hull. It is also fantastic when you ask the entire maximum possible place to enjoy the sun and the sea. Everything has been planned and built for maximum comfort. The sun-pad forward is truly large and the dinette astern makes it possible to enjoy a meal seated round a table. It has the spaciousness typical of open craft and at the same time has the added feature of a changing-room/cabin and bathroom. Places and volumes at will without any waste. 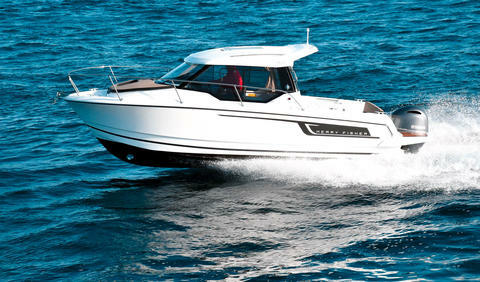 The Prince 25 design incorporates the qualities of exceptional safety, strength, stability, speed and comfort. It is equipped with 2 fascinating Mercury Verado 175HP engines, these FourStrokes provide astounding holeshots and punchy mid-range acceleration, all with outstanding fuel economy. This boat is equipped with a high-quality electronics and other equipment: Digital speedometer (SmartCraft), Digital onboard computer (Engine data), Compass, Depthfinder/Fishfinder - Lowrance HDS 7 Gen1, GPS/Chartplotter - Lowrance HDS 7 Gen1, VHF Radio- Lowrance Link 5, Bimini top, Sundeck cushions, Anchor electric winch, GRP bow boarding platform, Swim platform, Deck shower, Radio USB/iPod slot, Refrigerator etc. With this modern boat you are always on the safe side!! The Merry Fisher 795 adopts a dynamic and rewarding design, both inside and out. Its traditional V-shaped hull, best known for stability at speed and in more choppy conditions, a 795 delivers amazing performance at sea.